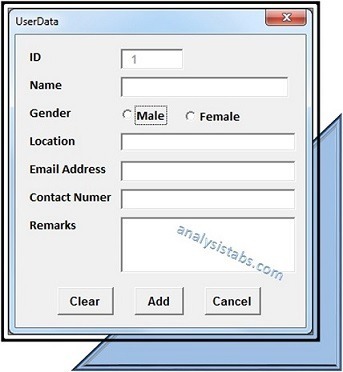 Data Entry Userform in Excel Workbook using VBA is used to enter data using userform and update data in the Excel database. I have created userform with following fields like Id, Name, Gender, Location, Email Address, Contact Number and Remarks. You can see the userform design in the following chapter. Following is the step by step detailed explanation to automate this project using VBA. How we are creating Data Entry Userform in Excel Workbook? Let us see! Here is the step by step process how we are going to develop this Data entry userform in Excel Workbook using VBA. Let me explain the key steps to develop this Data entry userform project. We are going to write multiple procedures with the below approach. Step 1: Variable Declaration: We will be declaring required variables and objects which are using in our procedures. Step 2: TurnOff screen update and Events: We are temporarily avoiding screen flickering and events triggering in the application. You can use this at the beginning of the procedure. Step 3: Create userform: Insert userform from the insert menu. Place required controls from the tool box on the userform. Step 5: Create function to find lastrow: Creating function (fn_LastRow) to find lastrow in the data Worksheet to update data into it from userform. Step 6: Create procedure to clear fields of userform: Create procedure (Clear_DataSheet) to clear data Worksheet columns (A to G) of data. Step 7: Cretae procedure to update data to the Worksheet: Create procedure (cmdAdd_Click) to update or add data to the Data Worksheet. Step 8: Create procedure to unload userform: Create procedure(cmdCancel_Click) to exit from the userform. Click on ‘cancel’ button or top right bottom cornerof the window to unload the userform. Step 9: TurnOn screen update and Events: Let’s reset the screen update and events of the application. You can use this at the end of the procedure. This is what I used to create Data Entry UserForm design. By changing or setting all the above properties and values of control the form will be looking like below. Create userform by adding controls to the userform from the Toobox. In this project we are placing seven Labels, two Radio buttons, six Textboxes and three CommandButtons.You can refer the design section of the Data entry userform to create userform. Step 4: Create Procedure for field validation. We have to validate the data before updating into our Data Worksheet. So, we need to gather the correct format of data from the user. We are doing this process while user clicks on the ‘Add’ button. i.e. everytime user enter the data and we validate all the fields (Textboxes and radiobuttons) for the correctness of the data. MsgBox "Enter Name! ", vbInformation, "Name"
MsgBox "Select Gender! ", vbInformation, "Gender"
MsgBox "Enter Location! ", vbInformation, "Location"
MsgBox "Enter Address! ", vbInformation, "Email Address"
MsgBox "Enter Contact Number! ", vbInformation, "Contact Number"
Step 5: Create function to find lastrow. Here is the function code to find last row in the Data Worksheet. Or You can use this function to find last row of any specified sheet by passing sheet name as argument to the function. Here is the code to clear the Userform fields. It is helpful when we want to update more than one record to the worksheet. Once you add record to the worksheet and then clear data fields to enter new data to on the UserForm. Step 5.2: Cretae procedure to update data to the Worksheet. Here is the code to add or update data to the Worksheet. .Cells(1, 5) = "Email Addres"
.Cells(1, 6) = "Contact Number"
Step 6: Create procedure to unload userform. Here is the code to exit from the userform. Or you can click on top right corner of the userofrm. Step 7: Enableing or TurnOn Screen Update and Events at the end of the project. Please find the following procedures to create Data Entry UserForm project. Double click on the Userform(FrmData) and add the following code to it. Insert module from the insert menu and add the following code to it. Here are steps to create ‘Data Entry UserForm’ on the worksheet. select the macro name(‘Oval2_Click) from the available list and click on OK button. Now, go back to the shape and click on the created shape to see the Data Entry UserForm on the Worksheet in the active Workbook. You can hit F5 key from the keyboard and you can see the Data Entry UserForm from the Data Worksheet by clicking on ‘Show Data Entry UserForm!’. Here is the Data Entry UserForm project workbook macro file to explore yourself. Just wanted to say a massive thank you for this. I managed to expand the form to include more rows and some combo boxes but I would have been unable to do it without your help. The example file works fine, but I could not recreate a new file using the directions. Had to create the “Data” sheet in the workbook, and name the “Home” sheet then my form would launch. Was getting an error when clicking on the Open User Form button, and it would not launch. I have user form in sheet1. But i would like to insert data in sheet2. How to do this? How to program “edit button” to have possibility of edition all items in table? F.e. after pushing ‘Edit’ we chose a ‘name’ and then all text boxes can be editable? All seems working, but I’m stuck with adding the first data. When I click the “Add” button the data remains in the userform. I need to click the “Clear” button to add a new entry. On second entry when I click the “Add” button, automatically the data in userforms clears out. Could you please verify how to clear the data when adding it for the first time?